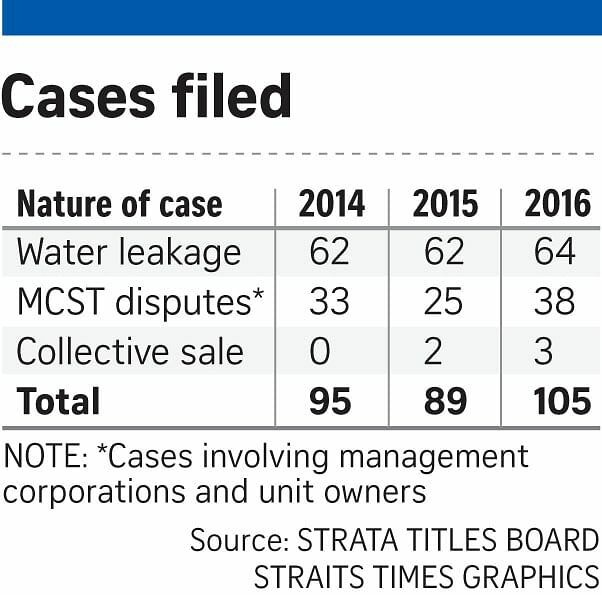 More than six out of every 10 cases brought to the Strata Titles Board (STB) in the last three years involved water leakage issues between unit owners, said the Ministry of National Development (MND). The figure has remained consistent for each of the past three years, said MND, responding to queries from The Straits Times. The board received 289 applications altogether between 2014 and last year, including 188 cases of water leakage, with disputes involving owners and management councils forming all but five of the remaining 101 cases. An MND spokesman said the STB received an average of 96 cases annually in the last three years. "The nature of these cases can be broadly categorised into issues relating to water leakage, MCST (Management Corporation Strata Title) disputes and en bloc sales," she added. The STB's role is to mediate and hear applications involving unit owners and management corporations of strata-titled properties, such as condominiums, or certain spats between such unit owners, among other things. In addition to disputes involving inter-floor water leakages, other examples include resolving differences in relation to by-laws of a particular condo, or in relation to convening a general meeting or nullifying a resolution. STB also hears applications for collective sales. Industry players say the high figures involving water leakage disputes come from ageing buildings and the provisions of the Building Maintenance and Strata Management Act (BMSMA) in relation to leakages. But the responding unit owner can rebut this statutory presumption by engaging an expert to probe the cause, and if shown the cause of the seepage did not come from his unit, then the burden of proof falls on the applicant owner of the affected lot to prove the source. MR LIM TAT, honorary legal adviser to the Association of Strata Managers, on how a defect is presumed to be caused by the property situated immediately above the affected unit, where there is evidence of dampness, moisture or water penetration. Mr Lim Tat, honorary legal adviser to the Association of Strata Managers, said there is a presumption that works in favour of the affected owner under the BMSMA in filing claims for water seepage. Under the Act, the defect is presumed to be caused by the strata lot or common property situated immediately above the affected unit, where there is evidence of dampness, moisture or water penetration, said Mr Lim. He added: "But the responding unit owner can rebut this statutory presumption by engaging an expert to probe the cause, and if shown the cause of the seepage did not come from his unit, then the burden of proof falls on the applicant owner of the affected lot to prove the source." As buildings age, the water-proofing membranes fail and water seepage occurs. Mr Lim said that while common property is maintained regularly by the MCST, the same cannot be said for strata lots owned by individual owners. "Given the above, I suspect that we will continue to see an uptrend in the number of cases affecting strata lot owners, as there is currently no legal requirement for owners to conduct periodic audits on the state of their units," he said. Leonie Towers management corporation (MC) chairman Pearl Lim said that based on its by-laws, the unit above the affected unit pays to rectify leakage problems, but if common property is involved, then the MC arranges for the repair. "When disputes arise between unit owners on this, then the MC steps in to settle the matter," she said. And if the MC cannot resolve it, the matter then goes up to the STB.